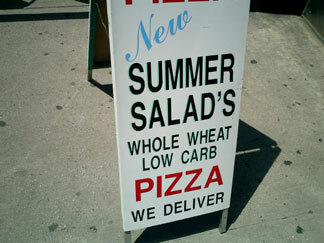 Complaint: Illegal use of an apostrophe, a misdemeanor which suggests that Summer Salad possesses some whole wheat pizza that is low in carbohydrates. Defendant: Rocco’s, a specialist in the creation and distribution of sauce-covered bread discs. Report: Officer was recently re-deputized after being re-equipped with a Casio Exilim digital camera similar to the Casio Exilim digital camera he lost two months ago. Officer witnessed the sign loitering at the establishment entrance. Sign did not attempt to flee, and in fact was very cooperative. Fine: $75, or 75 carbs.